I love seeing what people are knitting, sewing, and crafting. I love looking at pretty yarns and fabrics and discovering new yarn dyers. I love daydreaming and living vicariously through others as they travel the world. I follow not only knitters, crafters, dyers, yarn and fabric companies, but also foodies, fashion designers and bloggers, makeup artists, lifestyle bloggers, illustrators and artists, decorators and stylists (they usually have the most colourful and eye-catching photos that are just pure inspiration! ), and yeah...there might be a cat account (or two) and Socality Barbie thrown in the mix too. Needless to say, I spend a lot of time on Instagram on a daily basis. I also love Instagram photo challenges. I find the prompts that people come up with intriguing. I'm completely fascinated with how people interpret a word or a phrase and make it their own, and maybe show you something different that you may not have thought of before. I love being inspired and seeing the world through different points of views. Don't you? So what's up with all this Instagram talk? 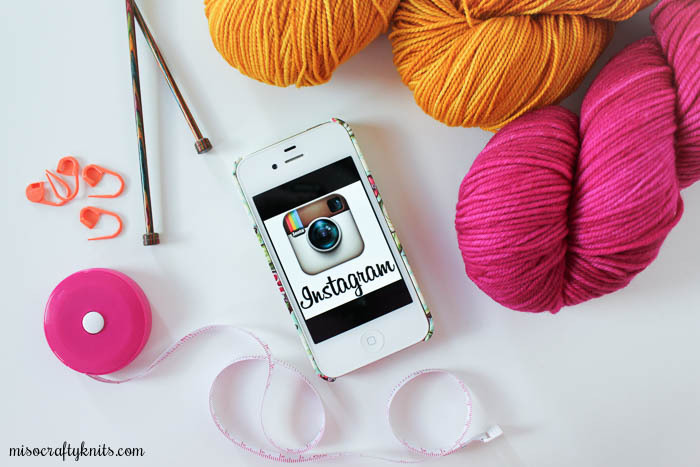 Well, I have something fun and exciting to share with you all: the super lovely Julie of Knitted Bliss and I are co-hosting a 10-day Instagram challenge!! 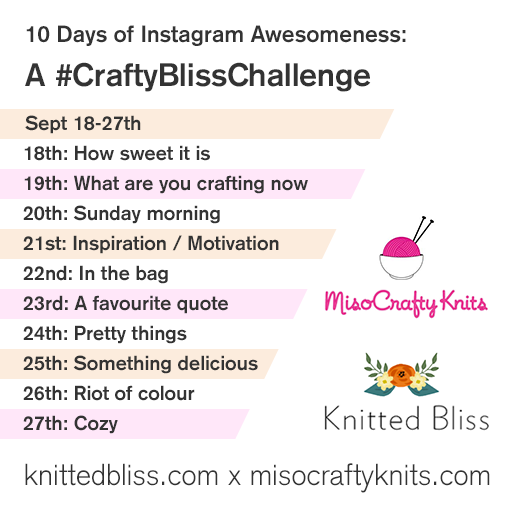 A #CraftyBlissChallenge will commence on Friday, September 18th and will wrap up on Sunday, September 27th. Julie and I would love it if you could join us! Don't have an Instagram account? What are you waiting for? It's free! Lost your knitting mojo? Haven't been inspired to pick up that WIP you cast on before the start of summer? Well don't worry, our prompts are broad and not knitting specific, which means anybody can join in on the fun! To participate: all you need to do is get creative, take photos, add captions (or not, it's up to you), tag them all with our special hashtag - #CraftyBlissChallenge, and share. To make life easier on yourself, you can save the image above or bookmark this post in your web browser (or stop by Julie's blog post here) and come back every day of the challenge to help you remember the prompts. Julie and I will be popping in daily to share our own photos and to check out what people are posting via the hashtag feed. Follow both of us on Instagram: Julie is @knittedblissjc and I'm @misocraftyknits to see our takes on the daily prompts (or to check out our feeds in general). If you don't have an Instagram account I hope you will still follow along on the challenge and see what everyone is posting. To make this even more fun, two randomly selected participants who have completed all 10 days of the challenge will be chosen to win some knitterly goodies. Who doesn't like goodies? Especially of the knitterly variety?? So remember to tag each photo with the hashtag #CraftyBlissChallenge so that Julie and I can see your photos and follow along on your challenge progress. this does look like fun, now to remember to do it all LOL! I normally can't do month-long challenges, I tend to get behind and then completely forget. That's why Julie and I decided it was probably in everyone's best interest (especially ours!) to make this challenge short and hopefully do-able in only 10 days! Oh, this looks super fun - I'm in, too!